Suzuki Intruder is a modern urban cruiser, whereas Avenger maintains its classic looks with a modern theme now. Check out the comparison of Suzuki Intruder 150 Vs Bajaj Avenger 220. 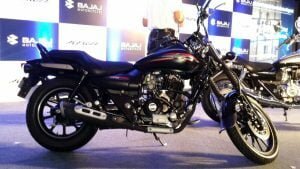 Bajaj Avenger 220 is getting ABS very soon. It has already been spotted at dealerships and as per initial reports, the prices will touch Rs 1.02 Lakhs. Avenger is the cheapest option available, but now with ABS, it comes in perfect competition with Suzuki Intruder 150. Intruder 150 is a scaled-down version of the powerful Intruder 1800. Intruder adapts a modern look with a flowy design and unusual curves. Avenger, on the other hand, maintains the classic Chopper look that it has been for the past 7-8 years. 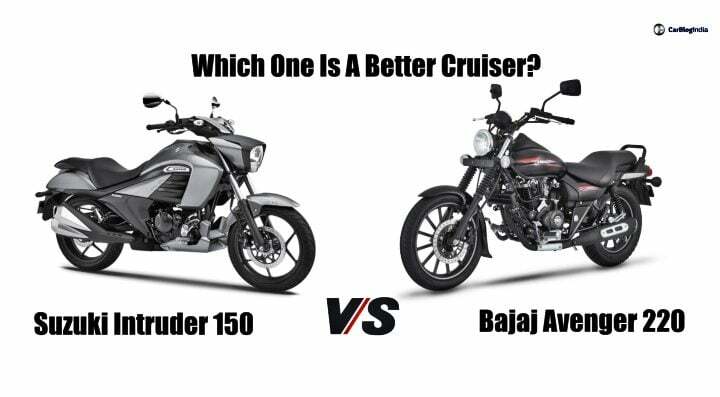 So let’s compare Suzuki Intruder 150 Vs Bajaj Avenger 220, that means, a modern cruiser vs a retro cruiser. The new motorcycle from Suzuki Motorcycle India features a really bold design and comes with the same 155cc single-cylinder engine that is available on the Gixxer street naked. It comes loaded with many features, such as alloy wheels, front and rear disc brakes, ABS, and a LED projector headlamp. 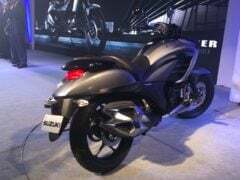 While the new Suzuki motorcycle comes with a 155cc engine, it is costlier than even the Bajaj Avenger Street 220. So, if you compare the prices of these two motorcycles, it becomes really evident that the new Intruder 150 is a really expensive product. For almost 10,000 rupees lesser, the Avenger offers a bigger engine and much more power. On the other hand, the Intruder 150 tries to make up for the high price tag by offering more features and a modern design. However, it won’t be wrong to say that the new offering makes the Avenger 220cc look pure value-for-money. The Avenger is the clear winner in this part of the comparison. 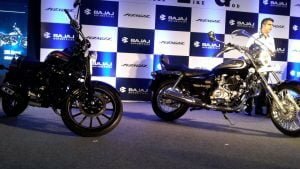 If you compare the specs of the two, it is very evident that the Bajaj model is far more powerful. The Avenger comes with a 220cc, DTSi, single-cylinder engine that produces a maximum power of 19 bhp @ 8,400 rpm along with a peak torque of 17.50 Nm @ 7,000 rpm. This is basically the same engine that also powers the Pulsar 220 DTSi, albeit, in a slightly higher state of tune. On the other hand, the Intruder makes do with a 154.9cc motor that outputs a far lower power and torque output. The engine for this motorcycle comes from the Gixxer 155. Maximum power is rated at 14.6 bhp @ 8,000 rpm while the peak torque is rated at 14 Nm @ 6,000 rpm. Both the engines come mated to a five-speed manual transmission. Thanks to the specs advantage that the Bajaj cruiser enjoys, the Intruder 150 loses this part of the comparison. 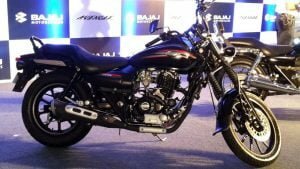 While the Pulsar 220-sourced motor makes the Bajaj model here really much more powerful, a bigger engine with more leads to a lower fuel mileage. The Avenger offers a fuel efficiency of around 35 kmpl. 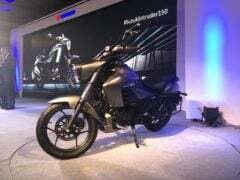 On the other hand, the new Intruder 150 gets its juice from the same 154.9cc engine that powers the Gixxer. Hence, we can safely expect it to offer as much as 47 kmpl in normal riding conditions. The new Suzuki Intruder 150 takes design inspiration from the M1800 Intruder. Hence, it gets what you can term as a modern-day interpretation of the cruiser bike format. Basically, the new motorcycle combines the relaxed riding posture of a classic cruiser motorcycle with a modern design that looks stunning. Features like LED projector headlamps and alloy wheels make this bike look modern. On the other hand, a low seat height and a relaxed riding position validate its cruiser credentials. In comparison, the Avenger 220 is a true-blue cruiser. The Avenger features a wider rear tyre and has a classic look.The Avenger is more of a highway-ready cruiser which seems to get design inspiration from the Harley Davidson Street 750. There is plenty of chrome along with black paint for the engine and alloy wheels. If you compare the instrumentation of these two, the Bajaj model gets an analogue speedo instead of the digital unit on the Intruder. Price- The Avenger 220 is the clear winner of this part of the comparison. It offers a more power engine and still costs a lot lesser. Specifications- The Avenger beats the new Suzuki hands down if you compare the specs. It offers much more power and torque, which comes in handy during high-speed cruising on the highway. Features- The Intruder 150 offers many more features. These include ABS, digital speedo console, LED projector headlamps and LED taillamp. Mileage- Again, the new Suzuki motorcycle turns out to be the winner of this part of the comparison. So, which of these two motorcycles will you want to put your money on? Share your views with us by writing them down in the comments section below. 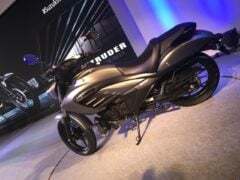 Also, stay tuned to Car Blog India for the latest news on launch and price of the new baby-Intruder.